The secret to an easy, yet luxuriously close shave on the go? 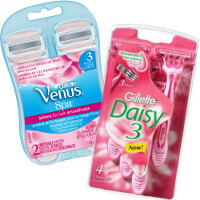 Try Venus Spa Breeze® Disposable razors-the first disposable razors with built-in shave gel bars. Simply add water for skin-loving light lather and a smooth shave without the need for separate shave gel.